Portadown captain Keith O'Hara (right). 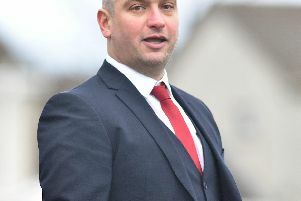 Pic by PressEye Ltd.
Portadown captain Keith O’Hara is calling on supporters to get behind the players in the aftermath of this week’s Irish Football Association ruling. The IFA verdict released on Tuesday confirmed a 12-point league deduction plus a 3-0 win for Coleraine following the loss of the club’s double appeal against disciplinary decisions. The Ports face Coleraine tomorrow at Shamrock Park aiming to improve on a Danske Bank Premiership tally of minus-six points after 11 games. Information in the official ruling has sparked anger within the Ports fanbase towards members of the Board of Directors. Portadown chairman Roy McMahon considers the decision to have “shafted” the club and has hit out at the IFA. Long-serving skipper O’Hara, however, has his sole focus on the field. “We cannot control anything else other than what takes place on the pitch,” said O’Hara. “We will need the backing of the fans as we attempt to turn around the situation. “I think having the decision hang over the team until this week probably had an impact on some players but now it is about drawing a line under the past and looking to the future to rescue the campaign. “You always had that small hope in your mind of getting something back off the 12 points but now we know the situation is not going to change. Kick-off this weekend will be 5.30 at Shamrock Park - with a special Oktoberfest event featuring live music, craft beer, cider, soft drinks and various promotions organised by the Portadown Supporters’ Society from 3-8 o’clock. Admission is just £5 before 4.30.